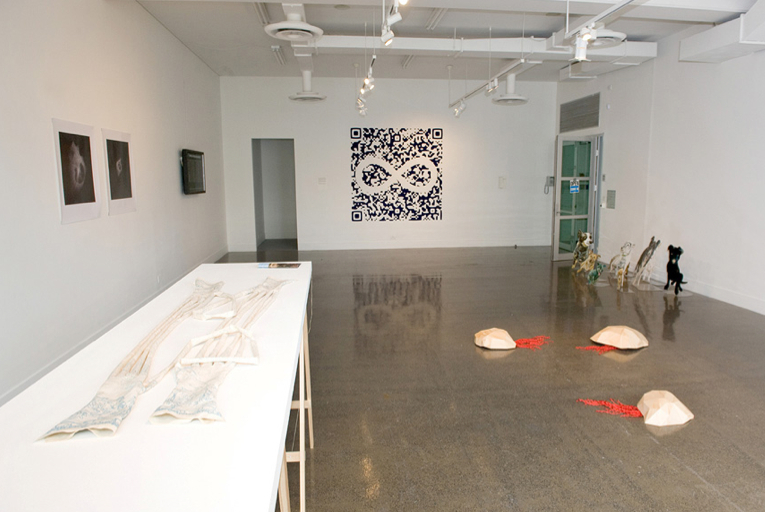 Us and Them - Umwelten Catalogue Essay, RMIT Gallery 2012.
by Associate Professor Linda Williams, RMIT University. The concept of umwelten is a term derived from the work of the early 20th Century biologist and ethologist Jakob von Uexküll. In the German umwelt means 'surrounding world', or 'self-centred world' and for von Uexküll umwelten conveyed the idea of the vast range of creatures occupying worlds whose meaning could be understood from their specific point of perspective. Within myriad umwelten then, diverse creatures experience their umwelt differently, yet von Uexküll's findings led him to conclude that communication, or semiosis, was a process of interaction common to the umwelten of all organisms: whether human or non-human. The study of these processes of communication formed the basis of biosemiotics, of which perhaps one of the best-known studies is the 'information dance' of bees. Performed in order to communicate to others in the hive on how they might find sources of pollen or nectar, each dance has been shown to convey surprisingly precise directions performed by individual bees based on their specific experiences of the umwelt1, yet engaged with shared social codes of communication. They convey quite complex information about the specific distance and direction to pollen, nectar or water referenced through the position of the sun. This code of shared information can, however, vary according to the experience of others in the hive, as Dorion Sagan2 notes in his introduction to von Uexküll's A Foray into the Worlds of Animals and Humans3, when the bees return to perform the 'information' dance the intensity of their communication depends considerably on how enthusiastic the others are feeling at that moment to receive the information. Hence the dancing bees are not simply programmed like little machines to 'deliver' information, but rather participate in complex and subtle forms of social communication and contextual meaning. Thus the biosemiotic process for bees is deeply relational, and for von Uexküll this was a process common to all organic life, including the life of creatures we have largely held to be mundane such as the flies, grasshoppers, ticks or even simple sea limpets occupying umwelten that von Uexküll brought alive into the anthropocentric limits of human awareness. In the context of global ecological deterioration, not least in the lives of bees, it is not difficult to see the appeal of von Uexküll's work on the experiential worlds of non-human animals, and the artists in this exhibition have recognised how fruitful a foray into the worlds of nonhuman others can be for the human imagination. The title chosen by the artists: Us and Them: Umwelten refers to imagined reality of these other worlds, whilst also acknowledging the inescapable context of the human world, and hence, in other words, to the 'us' in the title, and by implied extension to the anthropogenic causes of detrimental change to the fragile ecological relations between all umwelten. The artworks conveying the complex interactions between such umwelten are presented here in a diverse range of media including the photographs of English artist Steve Baker taken from his pushbike in his Roadside Series (2011). The view of the road is closer from a bike than a car, and this perspective is evident in the glimpses of the shadow of a bicycle wheel or edge of a pedal in the photos. From Baker's world view, as it were, from the bike, differences in the temporal scale of fast moving cars as against the more lumbering gait of animals is also thrown into relief. The slower cyclical movement of organic motion is also conveyed through the repetitive loop of images that records instances of the violent collision of these adjacent lifeworlds on English country lanes. We view these collisions from Baker's perspective, which unlike the typical exclusion of the human presence in canonical landscape photography, is represented as standing inside human spheres of agency yet is sufficiently detached to bear witness to the impact of the human presence. Taiwanese artist Yifang Lu presents images of domesticated animals painted on Perspex and mirrors in ways that draw attention to the opacity of paint whilst still allowing the transparency or reflexivity of the ground to call attention to the context of the constructed human world. For domesticated creatures of any kind the human world is transcribed consistently across their experience of umwelt, often from the moment of conception to death, yet these are non-human worlds that interconnect with ours on a daily basis, and in this sense are uniquely well placed to remind us of the interdependencies of the human and non-human worlds. In A Storytelling of Ravens (2012) Catherine Clover (UK/Australia) uses the built environment of the gallery, particularly the large windows facing onto Cardigan Street in Melbourne's inner city, to draw attention to the proximity of the human world and the worlds of wild ravens (Corvus mellori) who also live along this street. Clover's work comprises vinyl lettering covering the window and legible both from indoors and the street. The text is based on the artist's numerous encounters with ravens in the months leading up to the exhibition in May 2012. It refers to their vocal calls and bodily movements, and to the weather that shapes their worlds. Clover 'translates' the evocative calls of ravens into text by means of the phonetics used by naturalists which is then combined with audio works that, like the text, may be interpreted indoors and also on the street – and hence, into the umwelten of the ravens themselves. As such, this work is highly innovative insofar as it extends its semiotic range beyond the human world. Debbie Symons, on the other hand, has the human sphere and the anthropogenic causes of ecological degradation clearly in her sights in her video World Species Market (2012). Symons co-opts the format of a share market board by replacing financial data with data from the IUCN 'Red List' of endangered species from the years 2000 to 2011. By 2011, the Red List had identified a further 8,524 species since the 2000 list, which represents an increase of a serious threat to 2.1 entire species each day. Symons' unemotional and graphic visual approach is strategic insofar as it emulates the dry presentation of data in global market fluctuations in ways that evoke sense of potential collapse in the barriers between the abstracted world of capital and organic umwelten. 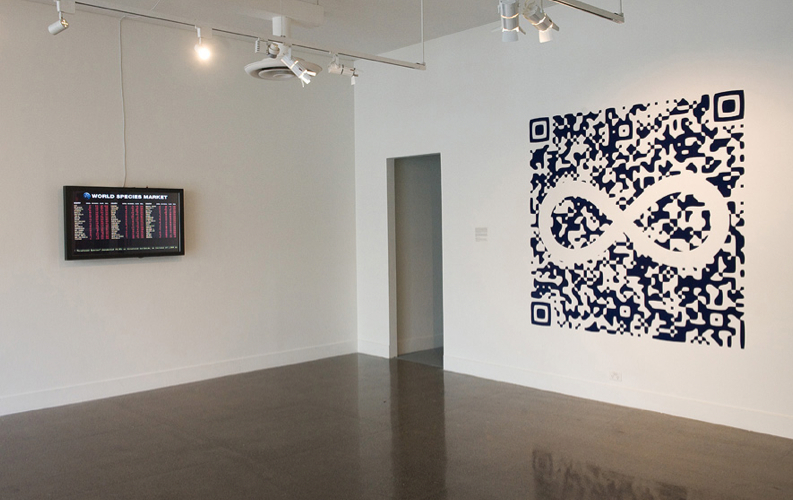 Canadian Métis artist Jen Rae extends the artistic adaptation of contemporary technology in a large QR Code installed on the gallery wall in flocking fibres in Awaken! Flag (2012). Rae's QR Code can be accessed by a mobile phone and QR reader/scanner in order to read the message behind the flock wallpaper to draw attention to an 'us and them' scenario: those equipped with technological knowhow and those who are not. This in turn refers to the content of the artwork, which draws parallels between artists as translators and Jen Rae's understanding of her Métis cultural heritage and its alternative worldview to mainstream western culture. Fleur Summers' biomimetic sculptural works Feelings (2012) are comprised of common, industrial objects. Inspired by Darwin's studies of the barnacle, these imaginary creatures mimic the biosemiotic proesseses of tiny biological colonies whose 'antennae' reach out from their umwelt to probe the ecological complexities of the wider world. In this case, a wider world inhabited humans whose movements interact with these magnified worlds of invertebrates in ways that draw our attention to the alternative realities of other lifeforms. 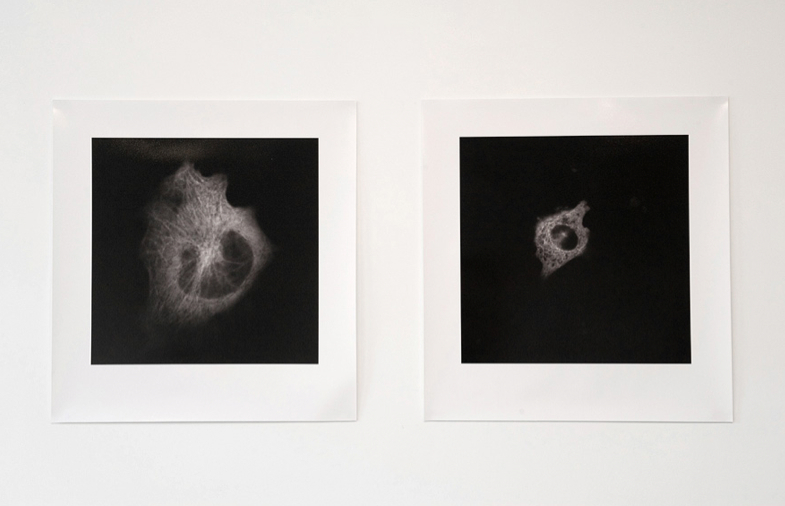 Jasmine Targett's Indivisible (2012) also magnifies fragments from different worlds, in this case through large photographic prints of microscopic images of a single human cell and an animal cell. Working with Dr Judy Callaghan from Monash Micro Imaging, the way Targett's images are juxtaposed acknowledges the parallels between cellular appearance and function in humans and animals whilst also serving as a reminder of the fragility of ecological connections and interdependency where radical change in one umwelt has the potential to reverberate across complex systems. While most of the artists in this exhibition focus on the intersecting worlds of human and animal, Rebecca Mayo extends the notion of 'Us and Them' to plant species, and to the invasive weeds introduced by humans to local ecologies that have evolved over time into complex, finely balanced biological systems. Mayo's Gorse Gloves (2012) are pairs of connected gloves stained with the gorse that has invaded the local environments along the Merri Creek. They refer quite literally to the human hand of intervention in the introduction of non-indigenous species, yet also attest to the role of human hands in environmental restoration work. Like all the works in this exhibition, Mayo's gloves are also a reminder of the hand of the artist in revealing the semiotic connections between umwelten - which is to say, between us and the myriad others whose world views are connected to ours, yet in all their wonderful variety are acknowledged for their indelible differences.